What better way to tickle your taste buds this monsoon season, while also protecting yourself against colds and coughs, than sipping some piping hot rasam? Rasams flavoured with lemon, tomatoes and cumin are a staple in most Tamil households. The versatile soup has its variations in Karnataka (saaru) and Andhra Pradesh. Rasam is usually taken with rice. But it's equally lip-smacking without any accompaniment. Rasams are sipped as a preventive or a cure for some ailments. For example, aattu kaal rasam (sheep leg soup) is recommended as nourishment for people recovering from any debilitating condition. Rasam flavoured with the bitter fenugreek seeds is said to cool the body and is recommended for menstrual cramps. Rasam made from the leaves of the deadly night shade plant cure stomach ulcers. Neem flower rasam cools the body, prevents fevers and boosts and clears the intestines of worms. Neem flowers in April but the flowers can be shade-dried and stored for up to a year. Garlic and pepper rasams are recommended for colds and coughs. Incidentally, the famous mulligatawny soup is an anglicized version of milagu tanner (pepper water) rasam. The medicinal properties of rasams are mentioned in Ayurvedic texts. According to this genre of medicine, pepper rasam has deepana and paachana properties it improves appetite and digestion. A good general rule to follow with rasams is that any rasam given for digestive problems should be mild and those given for cold/cough should be spicy. To one cup of water, add tamarind water, salt and rasam powder. Add cumin seeds, pepper and dhal. Crush a couple of curry leaves and add. Cover the vessel and boil well. Add water as needed. When the rasam starts to froth, skim it off. For seasoning, fry mustard, red chillies and remaining curry leaves in ghee; add to the soup. To two cups of water add tamarind water, salt, asafoetida, half the curry leaves and dal. Break the red chillies into two, fry in oil and add to the rasam. Boil the mix well till the tamarind smell is muted. Add water if required and bring it to a boil and remove from the fire. 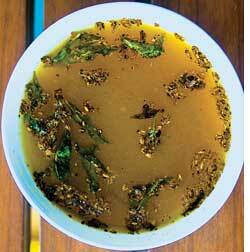 Fry the mustard, curry leaves in ghee and add to the rasam. Fry the dried neem flowers in oil till it darkens and then add to the rasam. Finally add freshly chopped coriander. Fry pepper, garlic, red chillies, dal in oil and grind into a paste. Without frying, grind cumin seeds and some curry leaves. Then in a bowl of water, soak tamarind for about 20 minutes to make juice. Remove the tamarind pieces. To the tamarind juice add the pepper/red chilli/dal paste, salt and some fresh curry leaves. Boil well. Add cumin paste. Let the mix boil till froth forms. Fry mustard, two red chillies in ghee to season.